Captain Marvel passed away unexpectedly after a very valiant fight against an unknown intestinal inflammatory response. We want to thank Dr. Pfann for making every effort to save Captain Marvel's life. Captain Marvel was a very active, unique bunny and he will be greatly missed! 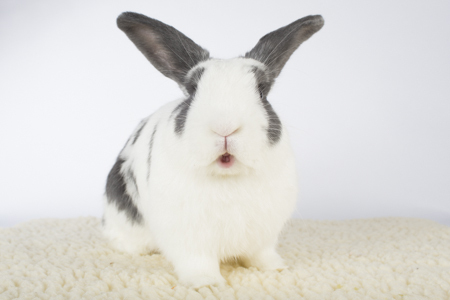 I am Captain Marvel, a VERY active, adventurous, neutered, young boy here at SaveABunny.I was rescued by SaveABunny supporters who found me hanging out on a trail in the Stanislau forest. Someone had dumped me in the woods to fend for myself. At first I considered it a big adventure. Then the reality set in that it wasn't a safe place for a pet bunny like me. So I hopped over to the humans and let them take me to safety. So why am I called Captain Marvel? Well I'm a bun's bun. I have upright ears but they also can "radar" like a lop ear bunny. I have dutch markings but have a bit of English spot in me as well. I'm loving yet assertive, a lap bunny who also has an agenda. I am all rabbits combined into one. So if you're looking for the entire rabbit experience wrapped up into a single, extremely gorgeous, entertaining package, drop by and see me. Oh yeah, be sure to bunny-proof your house REALLY well, because I like to find and make trouble.